Do you know about the Snapchat feature "My Eyes Only"? Do you know if your child is using that feature? Do you know enough about today's popular social media platforms to keep your child safe? Learn about important features of the social media platforms Twitter, Instagram and Snapchat at the next Community Learning Series, "Social Media: The Good, The Bad and The Ugly" on Monday, February 11 at 7:00 p.m. In this presentation, you will get important information related to social media, so that you can be and proactive and keep your child safe while using social media. The presenters are Kings High School students Abi Reitz, Sari Purkiss, Jordan Harkins, Alexis Wires, Thomas Forman, and Noah Young. 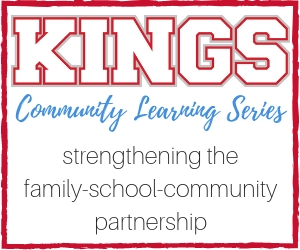 This presentation will be held in the Kings Junior High School Multipurpose Room (enter door D-5 from the parking lot located between the Kings Junior High School and the football stadium). Click here for more Community Learning Series Dates.